Beauty Buffet is back with its Mid-Year Sale of upto 70% off discounts from June 1 - July 31, 2012, or till stocks last. 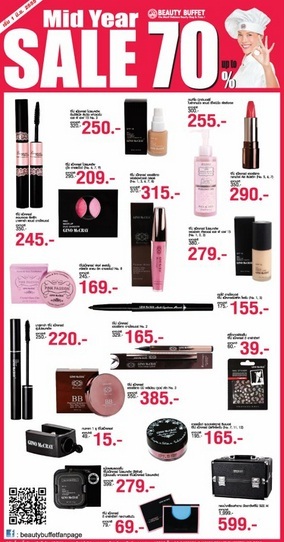 Among the discounted price items are cosmetics - mascara, eyeliner, eyeshadow, foundation, lipstick, BB powder, etc. and several body care and hair care products. Besides the discounted products, the promotion also has package sets of select 2 pieces for 319 baht, and select 3 pieces for 319 baht. 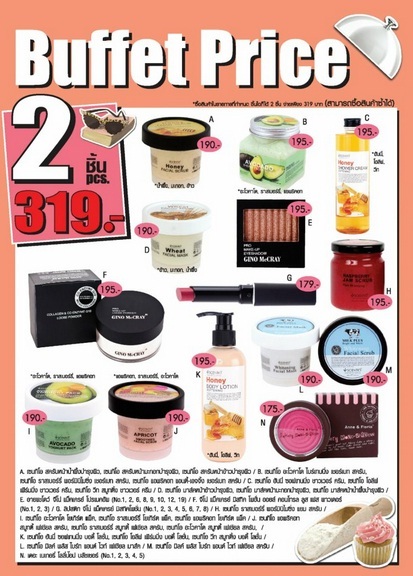 The Buffet Price 2 pieces for 319 baht offer lets you select any 2 pieces from a variety of products such as body lotion, body butter, scrubs, shower cream, and other cosmetics & body care products. The Buffet Set 3 pieces for 319 baht offer has several products like: collagen shower cream, collagen facial foam, mini curler, Lansley Wrap Up Body Sculpting Film, makeup brushes, mascara softener, etc. Beauty Buffet has over 70 branches of outlets at leading shopping centres such as Siam Square, MBK, Central, The Mall, Major, Seacon Square, Fashion Island, Future Park, BTS Siam / BTS Chidlom / BTS Phrompong / BTS Saladaeng, Lotus, Big C, Mega Bangna, and many more locations.